The Newtown Historical Society recently received a gift of a rare tall case clock made by Ebenezer Smith, who was not only Newtown's first clockmaker but was probably the only one in the 18th century. Smith was born in Milford, Connecticut, in 1745. He is thought to have moved to Newtown with his parents sometime after 1750. 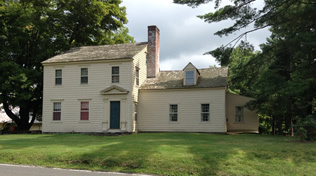 In December, 1767, he received the rights to his parents' house in Newtown's Newbury Parish on Whisconier Hill Road. A year later Smith married Esther Booth of Newtown. At that time, Smith was 23 and Esther was 21. Smith served in the Revolutionary War during the siege of Danbury. Esther passed away in 1821 and Ebenezer died in Newtown in 1830. Brookfield Historical Society records indicate they had one son, Daniel. The town of Brookfield was incorporated in 1788 and the section of Whisconier Hill where the Smiths lived then became part of Brookfield. Ebenezer and Esther's house and shop still stands today and appear to be in excellent condition. If you get off Exit 9 on US 84 and travel up Whisconier Hill (route 25) toward Brookfield, you will see the house on your left. It is a wonderful center chimney home with a half story ell where Smith's forge was located. The house is painted pale yellow and there is a red barn across the street. Smith was a rural craftsman and probably made living producing utilitarian items of iron, tin, pewter and sometimes silver. A few examples of his crafts are still extant. We know he made several tall case clocks with engraved brass dials. Note: the term "grandfather clock" did not become common until the late 19th century. Tall case clocks were a rare and highly prized item in the 18th and early 19th centuries as they cost about one year's income for the average family. As a result, these clocks were usually made for the wealthy. Such a clock is the one that has been given to the Historical Society. Nothing is known of its history from the time it left Ebenezer Smith's workshop until it came into the possession of the Jackson family of Newtown probably in the late 1940's. Jerome and Mary Jackson, originally from Massachusetts, summered in Sandy Hook with their three sons before becoming year-round residents in the early 1930's. They lived in the white antique house on Berkshire Road across from Zoar Road. Jerome and Mary collected antiques and their son, Jerome (Jerry) P. Jackson, collected clocks. Jerome, Sr., born in 1875, was a graduate of MIT and a World War I veteran. His wife, Mary, was a Wellesley College graduate and studied at Oxford University in England, a noteworthy accomplishment in a time when not many women attended college. She was a member of the Suffragist Party, working hard to try to win the vote for women. Jerome, after he retired from his career as an architect, ran Newtown Home Service with his two sons, George and Jerry, doing building and restorations in the area. The family was very active in Newtown, especially in the Historical Society (charter members), the Congregational Church (historian and clerk) and the League of Women Voters. Jerome passed away in September, 1958, Mary died in May, 1972, and their son, Jerry, who never married, lived on in the home in Sandy Hook until his death in 1977. At that time the Smith tall clock passed on to Jerome and Mary's granddaughter, Martha Jackson Harris, who lives in New Hampshire. For many years, Martha felt the appropriate permanent place for the clock would be at the Newtown Historical Society. In 2012 she contacted the Society and was assured the clock would be a very welcome addition to its collection. Arrangements were made and the clock returned "home" in early August, 2013. Mrs. Harris has made this gift in honor of her grandparents and in memory of the many happy times she spent through the years at their home in Sandy Hook. We are thrilled that this wonderful part of Newtown history has now returned home to stay. The clock, probably Smith's finest, now stands in the Matthew Curtiss, Jr. House Museum where it can be enjoyed by visitors. The case is cherry wood, in the Federal style and was most likely made by a skilled, but country cabinetmaker who possibly lived in Danbury or Woodbury. Because of the case style, we know this clock was made sometime after the Revolutionary War. In the 18th and early 19th centuries clockmakers did not make the cases. They made the "works" or "movements" and the case was made separately, ordered either by the clockmaker or the customer. This clock, an excellent timekeeper, has an eight-day brass movement and a brass dial engraved "Eben Smith" along with an inset calendar ring. Jerome P. Jackson and this clock are mentioned in the landmark book, "The Book of American Clocks", by Brooks Palmer, published in 1950 and still available. Mr. Sander is the past president of the Newtown Historical Society; he is a longtime member of the NAWCC (National Association of Watch & Clock Collectors). Mr. Sander is presently the executive director of The Antique Dealers Association of America Inc.